Well, it may have been the smallest moon we will be seeing in 2016, but the same can’t be said for the turnout for last nite’s sunset/fullmoon outing. 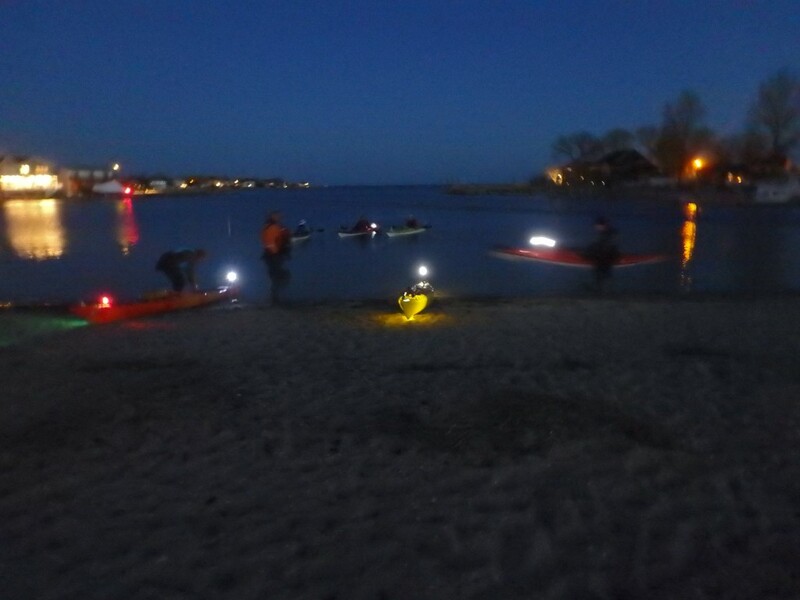 We had eight paddlers show up at the ramp at J.J.Burns & launch right on time @7pm. 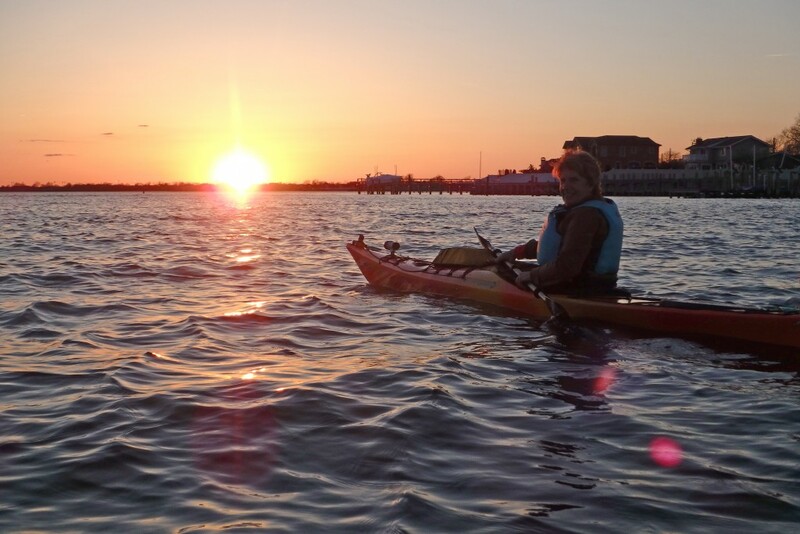 Expectations were understandably low due to concerns about the North wind that had been blowing steadily all day but Mother Nature came through for us yet again & kept those waters flat for a very memorable & enjoyable paddle. 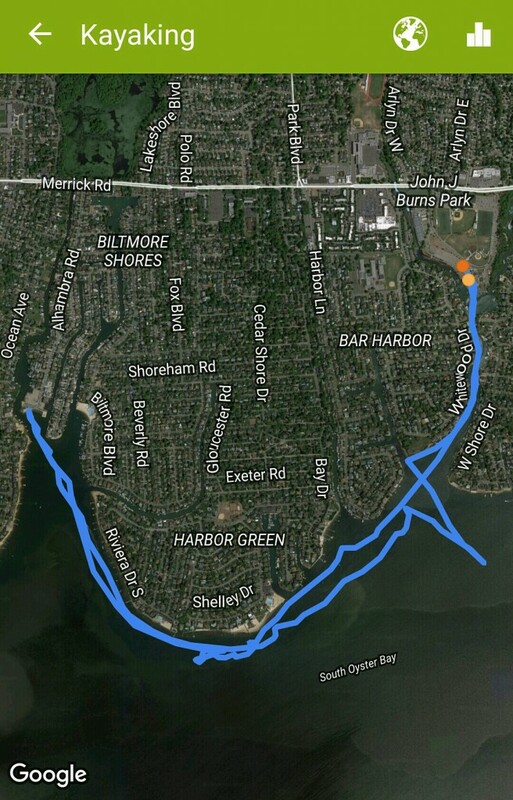 Though the wind was still a presence, by altering our planned course & staying pretty close to the shoreline we were only exposed for very small portion of the trip. Afternoon clouds had long cleared away giving us an absolutely beautiful sunset. & whether fledgling night-timer or a ‘seasoned’ sunset paddler, it never gets old as there is nothing like watching that whole horizon change colors right in front of you as you float peacefully, just inches above the water. 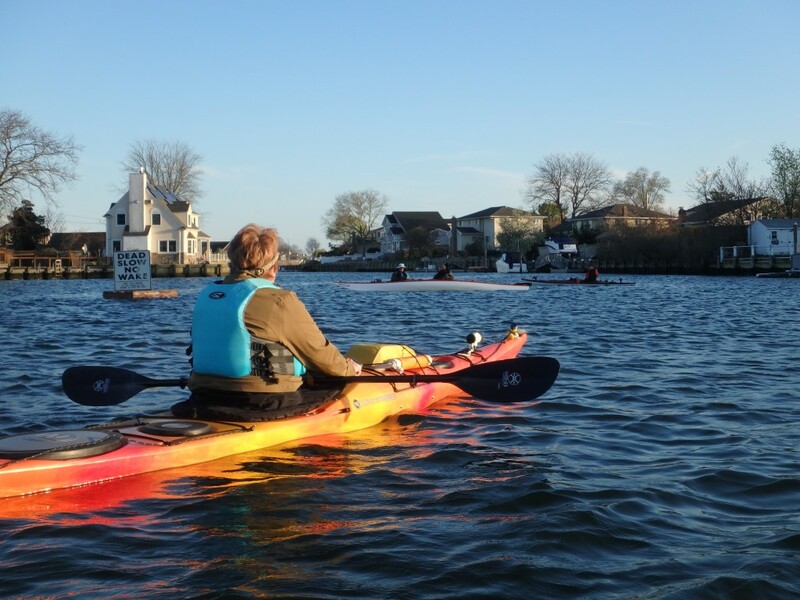 With the air temp dropping to the low 50º’s it got cold pretty quickly just standing around so it was just a short break & back into our boats we went. As we headed south, the light pollution from the neighboring houses was pretty minimal, giving us a great view of all the stars on this completely clear night. Just awesome to lay back on your back deck & take in the 360° view above. Back out in the bay heading East again, the wind/water still weren’t bad. Timing wasn’t bad either although we did have a few extra minutes waiting time for that moon to finally show up. But once it made its way over the lingering East end clouds that obscured the horizon line it was all worthwhile. 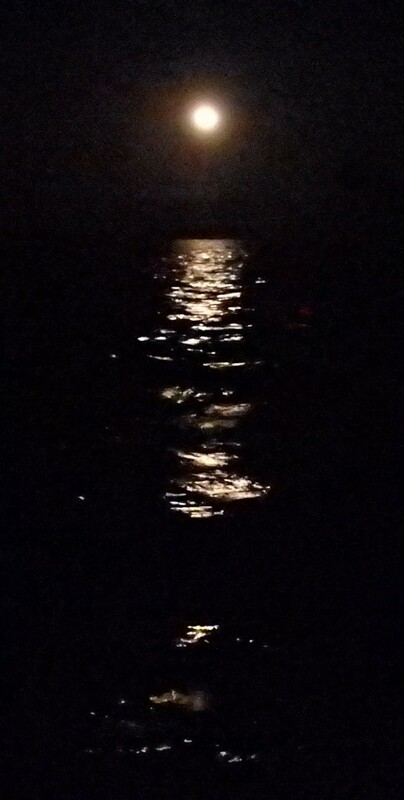 Just a great moonlit night. We were having so much fun all rafted up together laughing & joking we didn’t realize the time going by or the fact that the wind had moved us a half mile away! 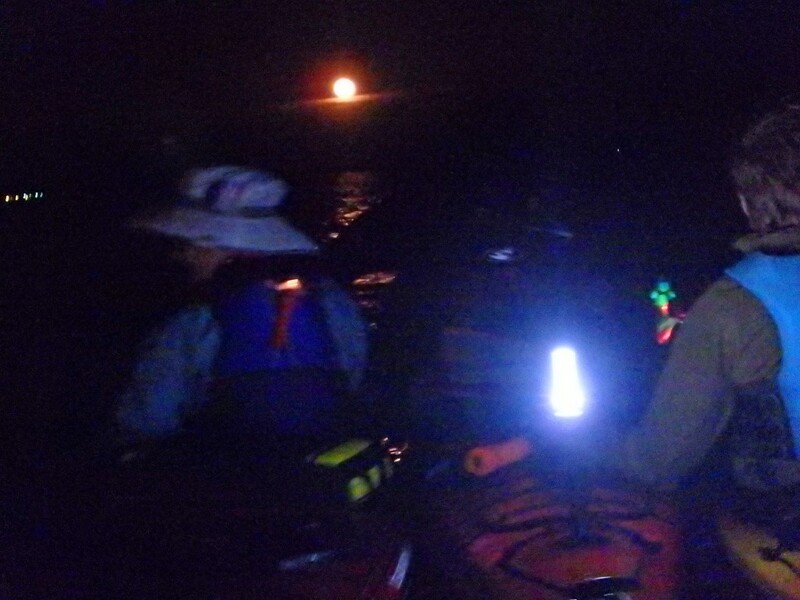 It was time to get those paddles back in the water & get back to the launch before that 11pm gate closing, Lol. -But it all worked out great. Had plenty of time to pack up & say our goodbyes ‘til the next time. Some of us didn’t want the evening to end just then, so 1/2 of the group ended up meeting at a nearby restaurant (aptly named “GoodLife”) for some great food and even more laughs. We’re solidly two-for-two now with these full moon outings. So, here’s hoping you can join us next month as we try to extend this winning streak into a May hat trick. Sorry I had to miss this trip. Glad to see a good number of NACK members got out and enjoyed the evening. Good sunset, good moon, good weather, good company. A total success! And good photos too. Great trip Alan! Thank you. Great article Alan, really enjoyed the evening with everyone, can’t wait for the next outing. Thank you Alan for the wonderful adventure.